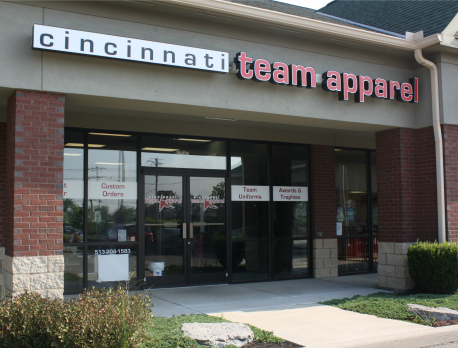 Cincinnati Team Apparel specializes in spirit wear, team uniforms, custom orders as well as awards, decals, and hats. We are members of the Northeast Chamber of Commerce and operate a retail store in Mason Ohio. Our store is located at 763 Reading Road Mason, OH 45040. Our customer service group is available during business hours. If you need to contact us after hours for any reason, please call our Customer Service Department at (513) 204-1583. Please leave a detailed message and a representative will return your phone call the next business morning. submitted on the Cincinnati Team Apparel website. telephone number, credit card information and bank account number].  We use the personal information collected from you to provide the best possible customer service. Such personal information as we collect is not used forany other purpose and is not shared. ways unrelated to the ones described above. 13 to provide information to us. you may redress these issues by contacting us directly.